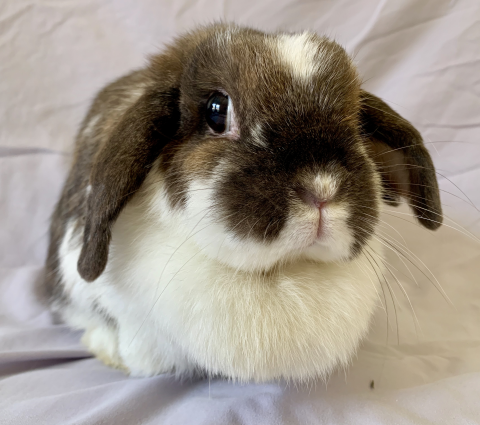 We currently have 41 rabbits available for adoption. 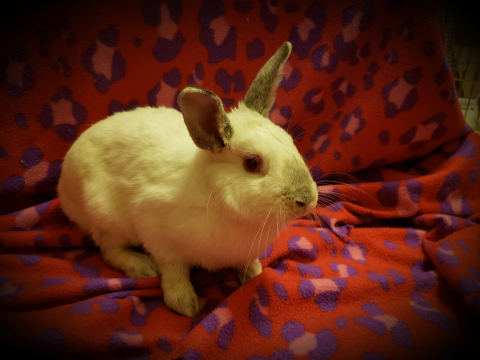 The following rabbits are available for adoption through the Indiana House Rabbit Society. 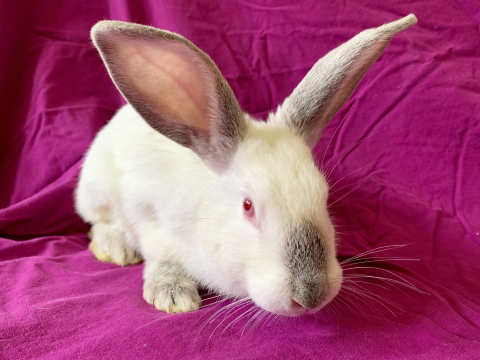 If you do not see a rabbit that fits your needs, please visit your local Indiana shelter. Note: All ages listed here are approximate and are based upon surrender information and/or veterinarian estimates. Abilene came from a 452 rabbit confiscation in Kaufman County Texas. 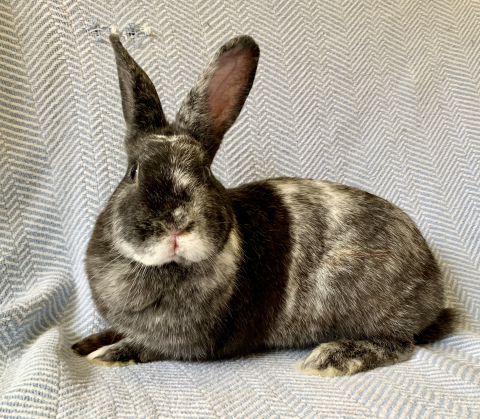 She is starting her best life with Indiana House Rabbit Society. Please check back for updates as we learn more about Abilene. This girl deserves a happily ever after! She needs to grow up a bit to be big enough for spay and then she'll be available for adoption. 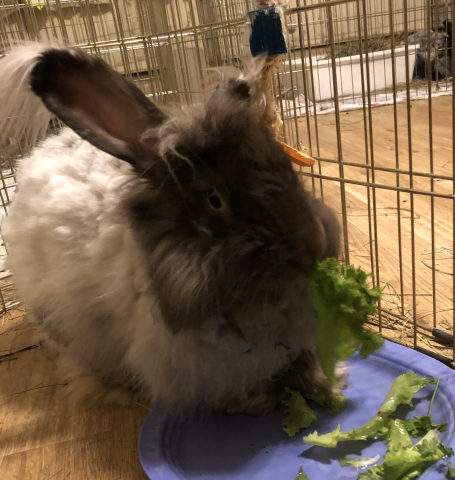 View this rabbit's full bio, including more photos! Amaryllis came from a 452 rabbit confiscation in Kaufman County Texas. 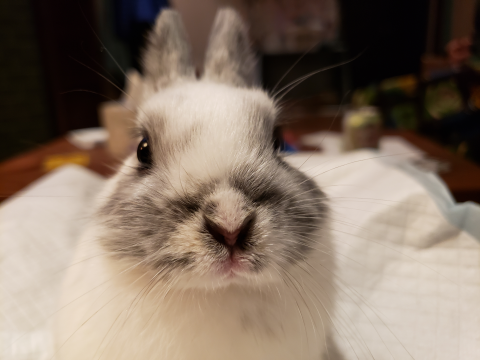 She is starting her best life with Indiana House Rabbit Society. Please check back for updates as we learn more about Amaryllis. This girl deserves a happily ever after! 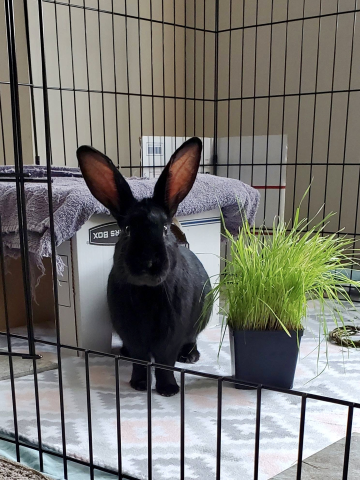 Bronte had been set free with a couple other bunnies in a neighborhood on the south side of Indy. She's a cute little fluffy thing! We are still learning about her personality. She will be available for adoption once healed from her spay surgery. 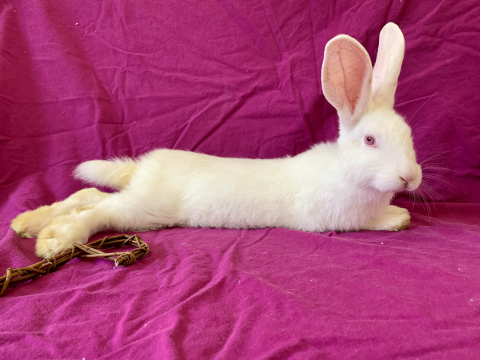 Cassidy came from a 452 rabbit confiscation in Kaufman County Texas. 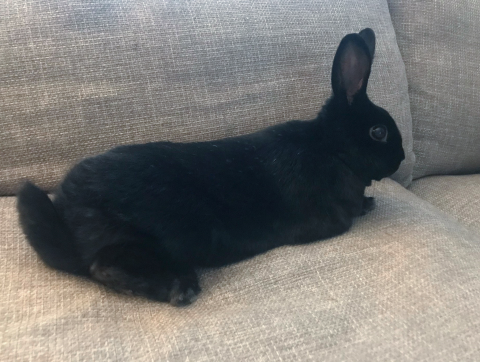 She is starting her best life with Indiana House Rabbit Society. Cassidy is bonded to Sheridan. Please check back for updates as we learn more about Cassidy. This girl deserves a happily ever after! Celeste came from a 452 rabbit confiscation in Kaufman County Texas. 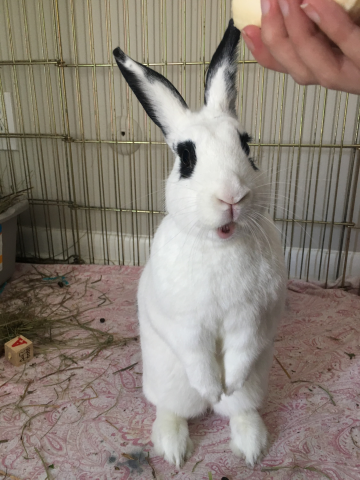 She is starting her best life with Indiana House Rabbit Society. Please check back for updates as we learn more about Celeste. This girl deserves a happily ever after! Celeste needs to be spayed before eligible for adoption. Chamomile is bonded to her friend Hoover. They were recently returned to the rescue and need some time to get used to a new living situation. 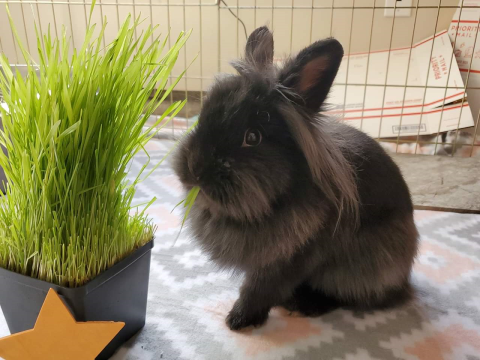 Chamomile was originally abandoned in an industrial area along with several other rabbits. 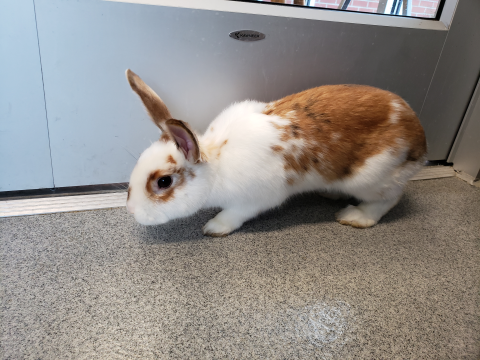 A good Samaritan captured her and several other rabbits, taking her to an animal control organization. Chamomile was in very rough shape when she originally entered IHRS foster care. She made great strides and learned that humans are kind beings, bringing ample food, and providing gentle pets as she tolerates them. She is still rather shy and reserved. Chami has had some additional health issues as well and needs quality veterinary care available. She and Hoover must find a home together. 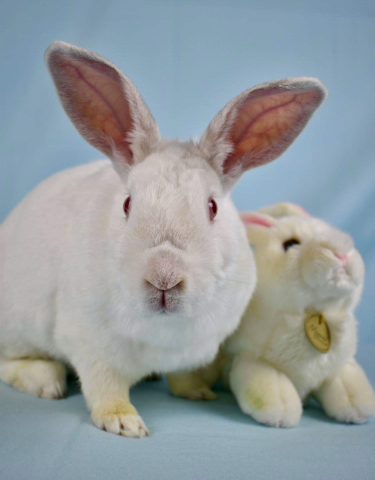 Can you provide Chamomile and Hoover a forever home where they can blossom? 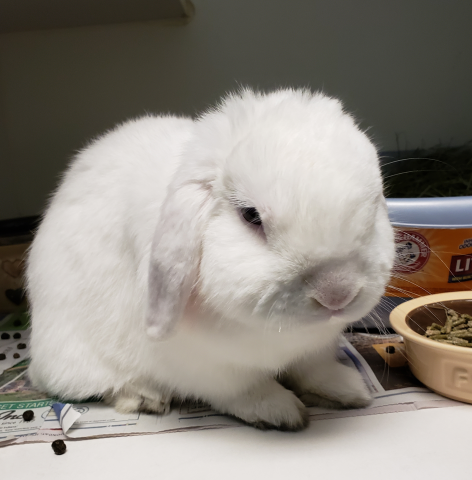 Corbun arrived at animal control after his owner passed away. Stay tuned while we learn his personality! He will be available for adoption after his neuter. Meet Delaney! She spent a month at an Indiana shelter and was just over it! She was in a very small cage and staff were afraid of her lunging - but she just needed more space and fewer hands in her face. Delaney didn't take long to warm up to house bunny life. Once in an exercise pen and allowed to stretch out without someone reaching for her, she quickly relaxed and spent lots of time lounging with her feet out behind her. And guess what - she loves petting! Delaney melts when you pet her head. She's super soft too. :) She also loves playtime, exploring everywhere. And she's a fan of the treat bag! Delaney is looking for her forever family where she can be understood as a big sweet girl who needs room to relax and explore. Diva came from a 452 rabbit confiscation in Kaufman County Texas. 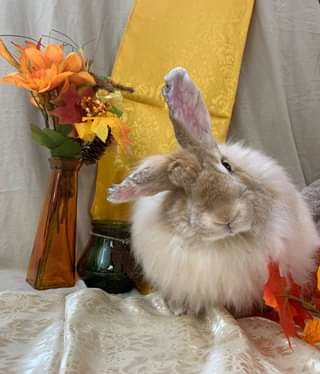 She is starting her best life with Indiana House Rabbit Society. 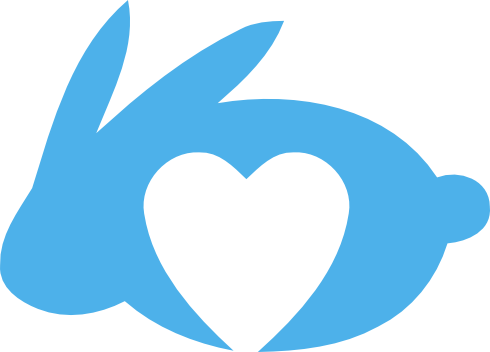 Please check back for updates as we learn more about Diva. This girl deserves a happily ever after! Diva needs to grow up a bit before she is big enough for spay and adoption. Farrah was surrendered to the shelter when her owner moved. She will be available for adoption once she is spayed! We will post more about her as we learn her habits and personality. She has fantastic hair! Half Pint is just a tiny baby! She turned up sick in a shelter after being sold too young by a pet store. We are working hard to get Half Pint feeling better - she came in very sick! Once she is feeling better, grows up with healthy food, and is big enough for spay, she will be available for adoption. NOTE: IHRS does not adopt out unaltered baby rabbits. Half Pint is not available for adoption. She will not be available for adoption until June 2019. Hoover is bonded to his friend Chamomile, who is more reserved. The pair was recently returned to the rescue through no fault of their own and are getting used to a new living situation. 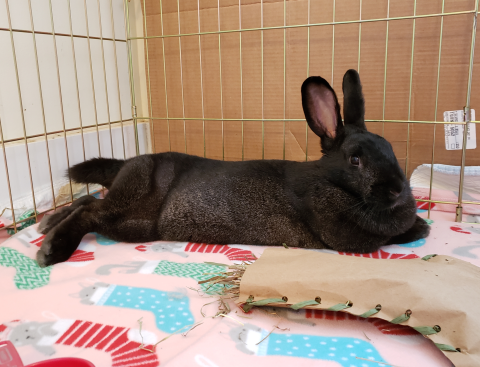 Hoover is a very mellow guy who mastered the "dead bunny flop" quickly after rescue. He has learned that humans are actually kind and provide him plenty of food and petting. Can you provide Hoover a forever home where he can continue to channel his Zen personality? He must be adopted with his friend Chamomile. Horatio is now in foster care where we are providing special physical accommodations for his balance issues. He has a long road ahead! 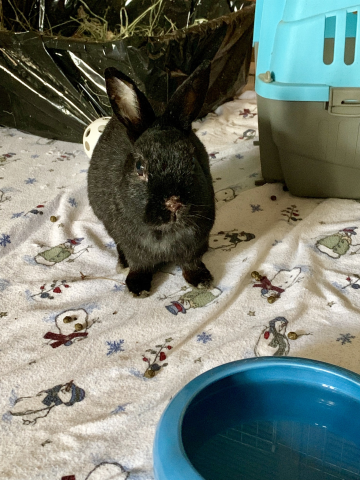 Hopefully Horatio will continue to improve with medications and accommodations, until he is ready for neuter and adoption! 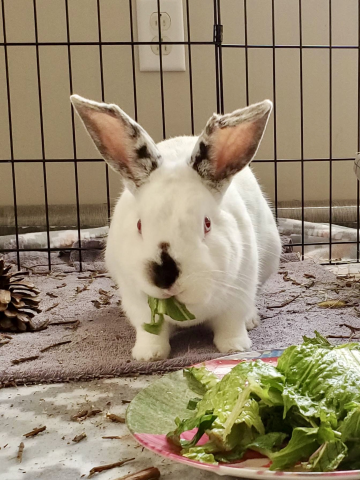 Jasmine had been set free outdoors and was running with a friend bunny for months! She was grateful to have a warm, dry, well fed home to sleep in once she was captured. Stay tuned for more info on this poor girl. Josephine came from a 452 rabbit confiscation in Kaufman County Texas. 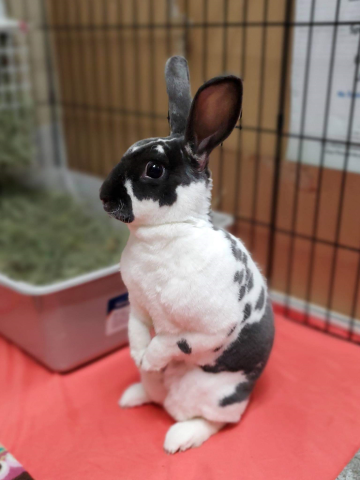 She is starting her best life with Indiana House Rabbit Society. Please check back for updates as we learn more about Josephine. This girl deserves a happily ever after! Kenzo is officially “out of the woods!” His bloodwork is normal and he has gained almost one pound. Kenzo’s ear mites and fur mites are nearly resolved. He is currently recovering from a bite wound, the last reminder of his life on the lam. This big guy landed at the shelter and he's not feeling so great! We will work to heal Kirby's upper respiratory disease and then he'll be ready for adoption. Kirby is a very engaged boy with a big attitude! 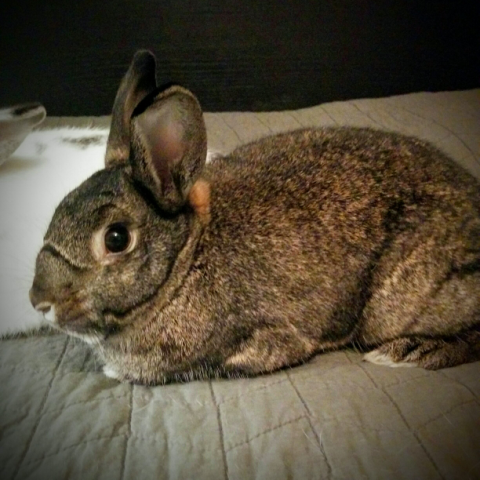 Please check back as we learn more about this bun. 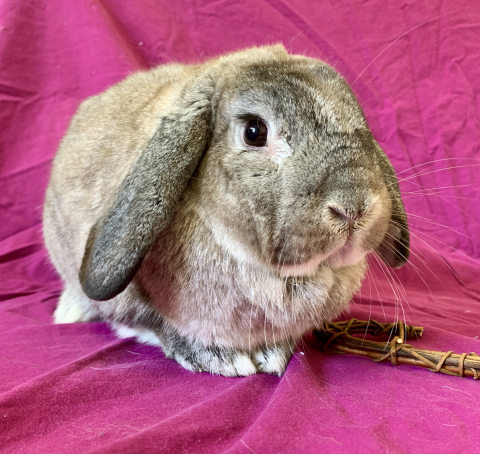 Lisbeth came into the shelter as part of a confiscation of dozens of rabbits. Lisbeth has been ill and we are working to help her feel better. Stay tuned as she heals! She will be available for adoption once she is healthy enough for spay. Mancala, Marla's baby #5, was born Labor Day 2014. She was a Mini-Me of mama - white with gray spots and racing stripe - and had helicopter ears for awhile but now has uppy ears. This is a sad story with a mostly happy ending. Sometimes a picture says a thousand words. 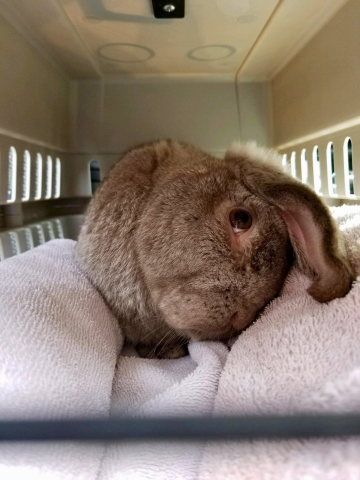 An Indiana shelter who doesn't handle a lot of rabbits posted a picture of a rabbit with some very serious medical problems and IHRS couldn't say no. Maru was pulled from this shelter because he was in need of immediate and intensive medical intervention to give him a chance to survive and thrive. He had severe urine scalding (all of the fur was missing from his underside) and bloody, infected sores on all four feet. He also showed some immobility to a rear leg. While Maru was found dumped in a parking lot, we have seen similar painful foot sores from rabbits being housed in wire bottomed cages. We assume Maru acquired his condition from such housing and then was set free to fend for himself - he could barely walk!! - when his owner did not want to deal with his medical needs. 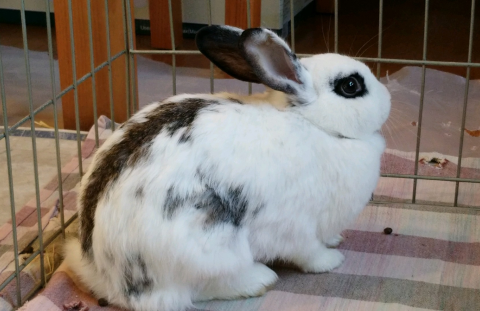 Maru's level of scald and sore hocks was far worse than other rabbits we've taken into rescue. Maru was provided with immediate veterinary care, starting with strong pain relief. Over weeks of antiseptic cleaning, antibiotics, ointments, and pain medicine, and housing on very special wicking flooring to keep him dry, Maru started to be able to walk. It took weeks before he could even lie down comfortably. Maru was scheduled for surgery on the worst of his foot sores, but supportive care and acupuncture and laser therapy led to great healing! Maru avoided surgery on his back feet. Unfortunately his front feet began to have more problems. The open sores healed, but the infection had deteriorated the bones of his wrists and feet. Eventually one wrist broke completely as the connective tissue no longer held together. The other wrist is tentatively intact but shows similar changes on x-ray. Guess what? Maru doesn't care. He has a crazy turn to one front paw, but he hops on the funky wrist and elbow. He uses a special litterbox with a low side so he doesn't stress his joints jumping in and out. Maru LOVES being part of the family action. He begs for treats and pets. He later survived liver lobe torsion surgery and is still as happy and friendly as ever. Maru inspires us because he doesn't let his disability get in the way of his enjoyment of life. We would love for Maru to find his forever family. His family gets all the love Maru has to give. :) In exchange, his family needs to be prepared for additional medical needs. Right now Maru is stable and needs no special care other than some housing accommodations: low sided litterbox, soft flooring, restricted from jumping. What we don't know is if his front feet will deteriorate further. This may mean arthritis and mobility issues, or possibly future amputation of one or both front feet and accommodations that would accompany that physical change, perhaps prosthetics and wheelchairs. If you are that special family who is able to see to Maru's future needs, he'd really love to meet you. We love Maru in foster care but wish for him to have his own forever home with even more attention than we can give. 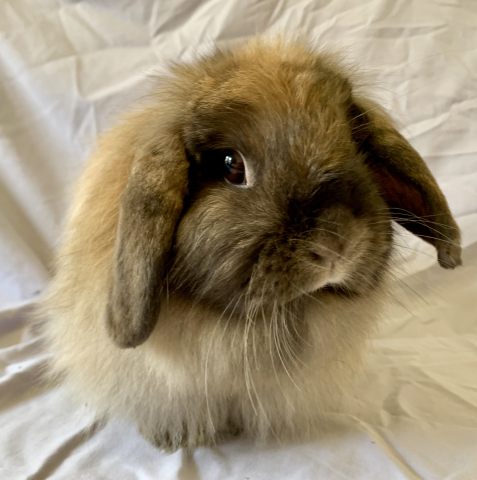 This sweet bun was turned into the shelter in Anderson with four other buns. Stay tuned while we learn more about her! Maybelline will be available for adoption once healed from her spay. Milli came from a 452 rabbit confiscation in Kaufman County Texas. 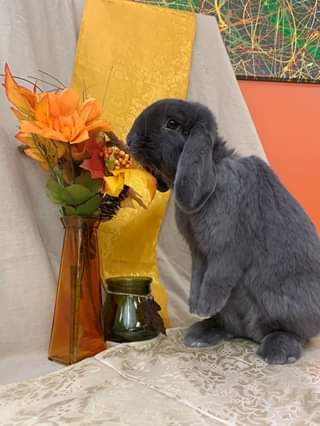 She is starting her best life with Indiana House Rabbit Society. Please check back for updates as we learn more about Milli. This girl deserves a happily ever after! Noel received a life saving Christmas wish. On Christmas Eve, she was found by a Good Samaritan hiding under a car and was brought indoors! Noel was surrendered to a local shelter and found her way to Indiana HRS. Unfortunately, Nöel has advanced hepatic coccidiosis that resulted from prior neglect. She has liver portal vein hypertension, a terminal condition, which we are managing. Due to the damage to her liver, spay surgery is not recommended. This breaks our hearts as Nöel is such an incredibly sweet girl. We do not know how much time Nöel has left, we will spoil her to the end. I'm Phoebe. I've been at hotel IHRS for a while now and I'm starting to figure out who I am. My previous guardians didn't want me anymore, so they let me go in a field behind a restaurant in Mooresville, IN. Even after all that, I have a clean bill of health and feel great! I am a tough cookie, so I survived, but let me tell you it was not easy. I'm thankful that the IHRS rescued me from the dangers that surrounded me and provided me a warm place to live, good food, keep me healthy and make friends with me. Sometimes, however, I miss the wide-open spaces that I had. I'm independent. I want space ... as much as you can give me! I can take care of myself and I've done it before, but I'm glad that I don't have to anymore. I like attention from my hoomans but I'm still working on trust issues. I don't know if I suffered trauma from my last hoomans or just turned a little wild after being out on my own. I'm still working through that with my therapist, lol. I'm curious and playful. I also like to climb up on things. I have good litter box habits, but I always want a litter box nearby. A girl should have to go to far to go to the bathroom, you know? Sometimes I like to be pet, but I have to be in the mood. That may change if I get to spend more and more time with you (and give me Oxbow cookies). I'm very cute (and I know it) and I like to make you laugh. I'm not sure if I'll ever be a lap bunny though. And I'm not really sure about bunking with another rabbit. It would take a very special one to be my roommate -- one who won't cramp my style. I'd probably like it better to have my own space. So what do you think? Do you have what it takes to earn my trust? It might take awhile, but it will be super rewarding when you earn it, I promise you that! 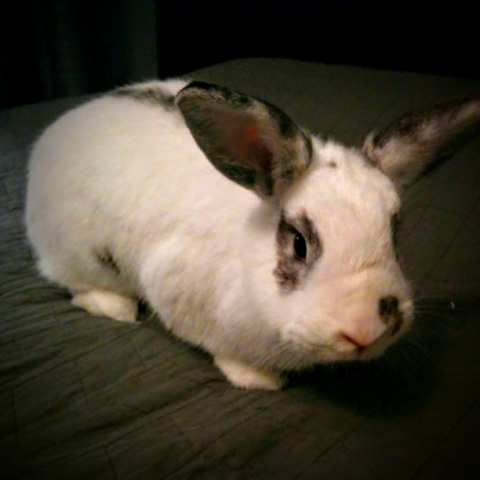 Regina had been set free by her owners in a neighborhood with their other rabbits. Fortunately a bus driver spotted the bunnies and alerted the community. 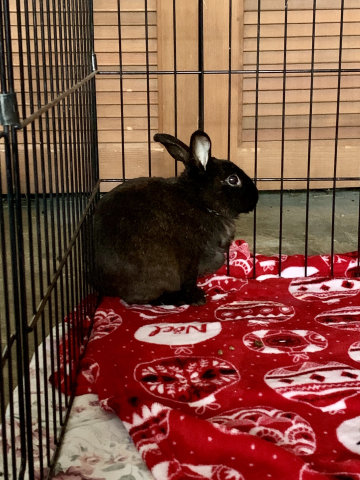 IHRS volunteers caught the buns and after Regina spent a bit of time at the shelter, she officially joined us in rescue. This girl likes house bunny life! We are still learning her personality and will report more info soon. Regina will be available for adoption after she heals from spay. Poor Ripple was running loose with a dozen other rabbits, none of whom survived! Ripple was reported by a neighbor to animal control, who was unable to capture him. The animal control officers contacted our rescue and our volunteers were able to catch this poor guy. After a few days at the shelter, Ripple was sprung to rescue! Ripple seems a bit overwhelmed indoors, perhaps the first time in his life he's experienced indoor living... but even after a few days, he is warming up and interested in where all the food is coming from! We hope it won't be long until Ripple is cuddling up to the people in his foster family. He'll be ready for his forever family once he is healed from his neuter. 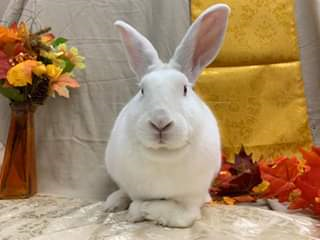 Rocky came into the shelter as part of a confiscation of dozens of rabbits. Rocky has been ill and we are working to help him feel better. Stay tuned as he heals! He will be available for adoption once he is healthy enough for neuter. 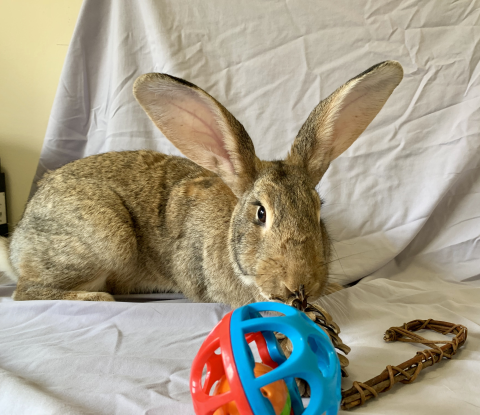 Rubik is a fantastic boy who has been waiting for his forever home for a long time! 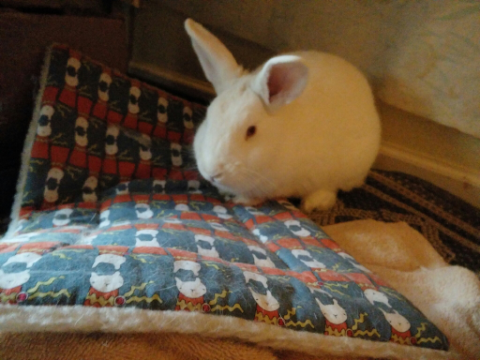 He was born in foster care, and he's been lucky to have only known the life of a pampered house rabbit. 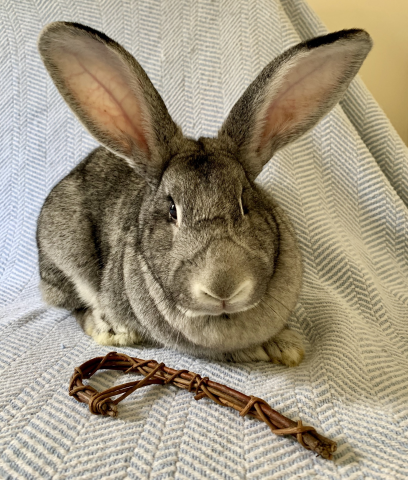 He can be shy at first, but once he knows you he loves to come see what people are doing and wants to be petted - if you happen to have treats or his food, he's VERY interested! He loves to play with baby keys and stacking cups, and a new willow basket never lasts long. 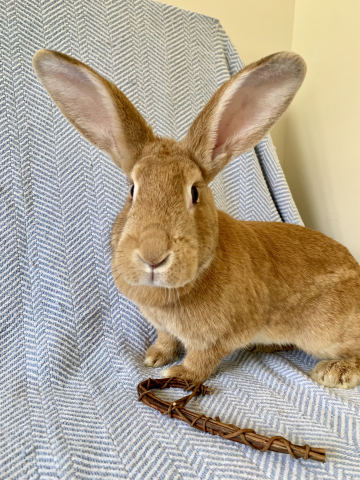 He's very sweet, and has done really well with children in his foster home (we strongly recommend supervised interaction between children and rabbits; rabbits are pretty fragile, and it's best if children interact with them on the floor). He may also be a good candidate for pairing with a girlfriend. Rubik has excellent litter box habits, and is a pretty tidy boy in general. Sheridan came from a 452 rabbit confiscation in Kaufman County Texas. 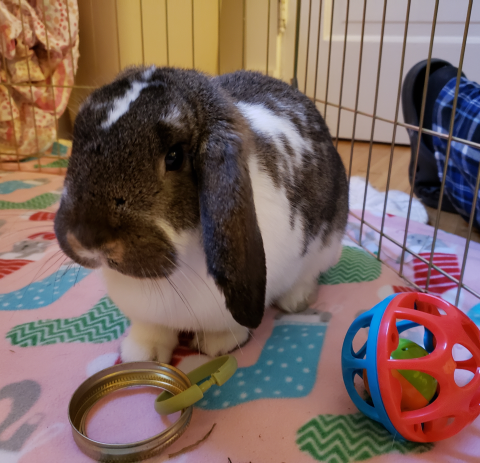 She is starting her best life with Indiana House Rabbit Society. Sheridan is bonded to Cassidy. Please check back for updates as we learn more about Sheridan. This girl deserves a happily ever after! Ol' Blue Eyes is here - meet Sinatra! He was surrendered to a large public shelter when his owner was moving, and was reported to be a few years old. Sinatra wants attention! He kept begging for someone to pet him at the shelter. He'll be ready for adoption once he is neutered. Stay tuned for more info on his personality.